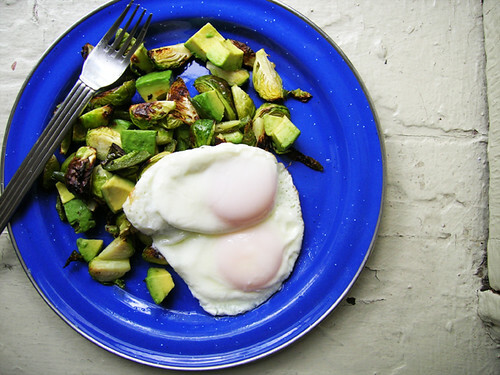 Remember the formula for this hash is avocado + whatever vegetable + a pepper, hot or sweet. Trim and quarter the brussels sprouts lengthwise, and seed and sliver the pepper. Toss them in a baking pan with a little olive oil and salt, and put them in the oven for fifteen minutes. Cut up the avocado into hash-size pieces and stir them into the roasted vegetables. Fry some eggs in a bit of olive oil or butter in a skillet over medium high heat. I crack my eggs in the oil, let them set a bit, then dribble in a little water from the kettle and cover the skillet for a couple minutes. Plate the eggs with the hash.